Happy Saint Patrick’s Day, 2012!!! Happy Saint Patrick’s Day, 2012!!! published on March 16, 2012 Read more posts by the author of Happy Saint Patrick’s Day, 2012!! !, MikeNo Comments on Happy Saint Patrick’s Day, 2012!!! 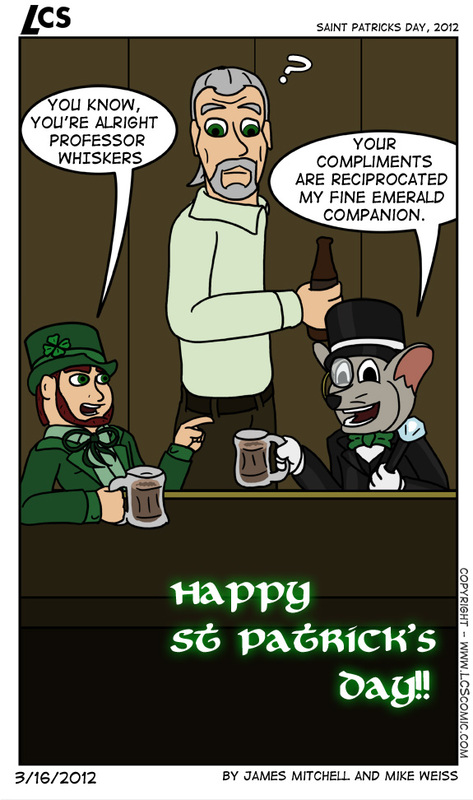 Mike: So an aging hippie, a leprechaun, and a fancy anthropomorphic mouse walk into a bar; it must be St Paddy’s Day. So get yourself a drink and enjoy life during this fine celebration. James: Prof Whiskers? Damn, I must be drunk already.